Saturday April 28th 1900 Will went to town and took the turkeys up and went up to our own farm. I was busy doing baking all forenoon and the boys took out the dining room stove at noon and I did sweeping in the afternoon. I was very tired tonight. 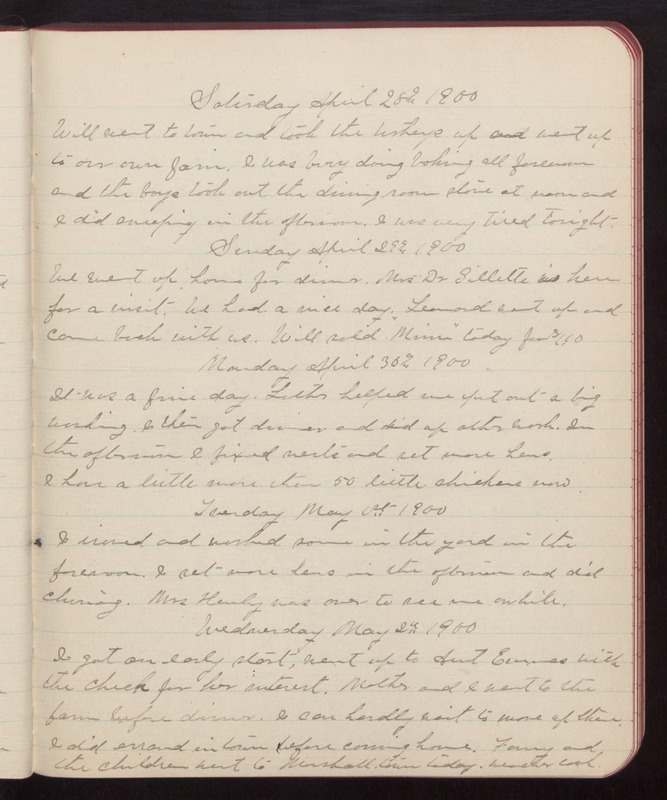 Sunday April 29th 1900 We went up home for dinner. Mrs Dr Gillette is here for a visit. We had a nice day. Leonard went up and came back with us. Will sold "Mirren" today for $110 Monday April 30th 1900 It was a fine day. Luther helped me put out a big washing. I then got dinner and did up other work. In the afternoon I fixed nests and set more hens. I have a little more than 50 little chickens now. Tuesday May 1st 1900 I ironed and worked some in the yard in the forenoon. I set more hens in the afternoon and did churning. Mrs Henly was over to see me awhile. Wednesday May 2nd 1900 I got an early start, went up to Aunt Emmas with the check for her interest. Mother and I went to the farm before dinner. I can hardly wait to move up there. I did errand in town before coming home. Fanny and the children went to Marshall town today. Weather cool.